I washed the kale, tore it into pieces and mixed it with salt, pepper, some chili and paprika powder as well as three tablespoons of oil. These bits then got evenly distributed on two baking trays and slowly roasted in the oven (130 degrees for about 30-40 minutes, swapping the baking trays around once or twice). That’s it! 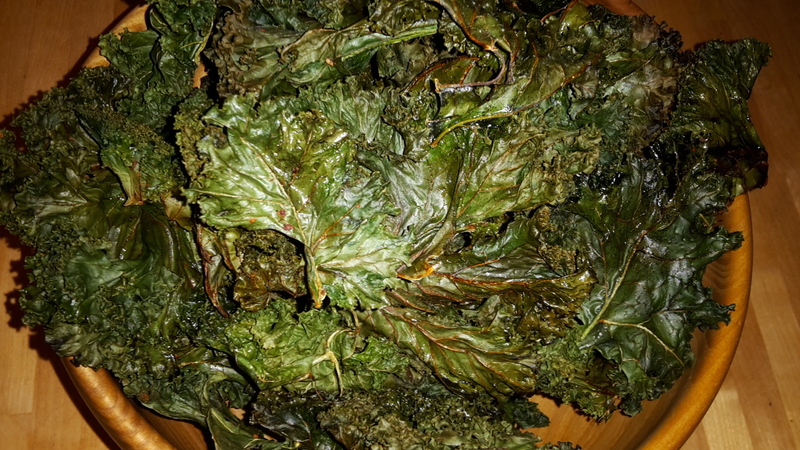 Out came crunchy kale crisps full of flavour that are almost guilt-free as all they contain really are those three spoonfuls of oilve oil. So as long as you don’t eat the whole load in one go (believe me, you couldn’t anyway), they’re an easy, healthy and tasty alternative to potato crisps. And they look pretty cool too!